Difference between revisions of "XenErgy"
"The power for true heroes." XenErgy is an energy drink produced by Clan Scholae Palatinae, named after and blessed by Emperor Xen'Mordin Vismorsus-Palpatine. It originated on Judecca in late 33ABY and was at first marketed domestically. Plans for expansion do exist, though. The list of ingredients is top-secret and much speculated about - even by Palatinaeans close to the Emperor. The beverage is the result of a smear campaign of Marick Arconae to discredit his long-time somewhat-friendly-rival the Emperor, claiming him to make his subordinates drink his sweat to absorb some of his powers. Xen'Mordin however took up the rumor, and with assistance of renowned scientist Elincia Rei, an energy drink was created and marketed in record time. Curiousity, juvenile dares and a spark of genius provided a sucessfull start for the brand. 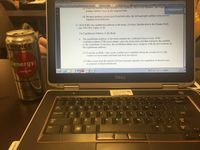 One member of Scholae Palatinae posted a picture of his homework in the Clan's Telegram channel, with a can of XYIENCE Xenergy Cherry Lime to the side. A few bad puns later, the idea was born, fleshed out, and commissioned. This page was last modified on 20 January 2019, at 02:21.